Stocks that qualify for near permanent buy and hold status are rare. It’s the nature of investing in stocks to have companies that lose their way or don’t live up to expectations. Then there are the new stocks we find that may be exciting opportunities, and to invest in them current holdings may need to be sold to make room in the portfolio. That said, a handful of stable, long term visibility dividend paying stocks can provide a solid base upon which to build the rest of your portfolio. Buy and hold income stocks need to meet a strict set of criteria. Primary is a long history of dividend payments. This history should include steady dividend growth and no dividend cuts. These factors give companies that are conservative and successful in their businesses and have a high level of desire to reward shareholders. While there are a number of “Dividend Aristocrat” stocks with long histories of dividend growth, these well known names come with low dividend yields. Typical dividend yields from this group run 2% to 3%. My other criteria is for the stocks to pay attractive, meaningful yields. Dividend yield will be a major component of the total return from dividend growth stock. Higher yields mean more of the return is locked in. Dividend income is also real cash flow that can be reinvested, taken as income, or used to make other investments. Here are three stocks that can make a great core to an income stock portfolio. Tanger Factor Outlet Centers (SKT) is the only pure play, outlet style shopping center real estate investment trust (REIT). The company was one of the originators of the outlet mall concept. Tanger has increased its dividend every year since the company’s 1993 IPO. 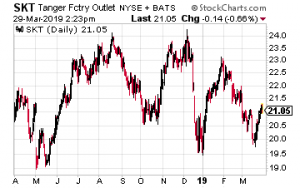 Currently this REIT is going through a period of flat growth. The challenge is a significant number of client retailer bankruptcies. The returned stores need to be filled with new retailers. Tanger has gone through this cycle before. The company maintains a “fortress” balance sheet and dividend payout is a low percentage of FFO per share. The current slow period means you can buy SKT with a very attractive 6.75% yield. 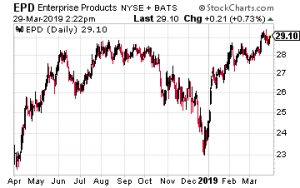 Enterprise Products Partners LP (EPD) is a large-cap $62 billion market value master limited partnership that provides a wide range of energy infrastructure services. a marine transportation business that operates primarily on the United States inland and Intracoastal Waterway systems. EPD increases its distribution rate paid to investors every quarter and has grown the payout for 20 consecutive years. 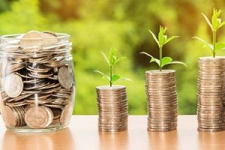 Currently the company pays out about 60% of distributable cash flow, leaving it with over $2 billion per year in retained earnings to invest for future growth. 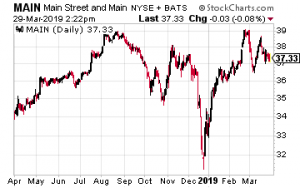 Main Street Capital Corp. (MAIN) is a business development company (BDC) that provides debt and equity financing to small and mid-sized corporations. BDCs operate under special organization and tax rules that provide corporate income tax relief. Those rules can also be restrictive against growth for anything less than the best BDC management teams. By almost all measures, Main Street can lay claim to being the best company and best stock in the BDC sector. Main Street has over $4 billion in assets under management. Since it went public in 2007, MAIN has more than doubled its dividend rate. The dividend has never been reduced and has always been fully covered by net investment income. Dividends are paid monthly and in recent years has been increased one to two times a year. Since 2018, Main Street has paid additional supplemental dividends twice a year. Shares of MAIN yield 6.4%. I I am impressed by what I see and would appreciate continued reports such as this. I do not get into Amazon type stocks and try to keep notice on Tech Dividend Stocks. Currently most of my investment is into XOM.